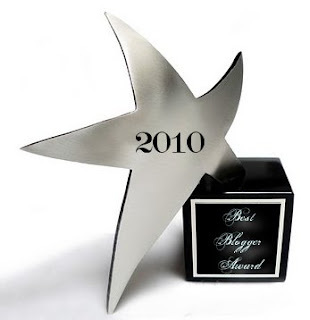 I’m super happy to be nominated once again on Mindful Musing for Best Blog of the year. -Fill out the form below. Your name and e-mail are used for two reasons: 1) to make sure people don't just reload the form and vote for the same person over and over again and 2) to contact you if you win the giveaway! -Since I already have the URLs of all the blogs listed, all you have to do is type the name of the blog you wish to vote for. The only time you need to provide a blog URL is if you choose to use the write-in option. -The top 10 will be announced the week of January 1st, as well as the winner of the giveaway! I'm so excited for you!! :) Congrats on being nominated!